If You Need Tennis Court Resurfacing, Call Today! First Serve Productions is here to help you play at the top of your game. If you're in Napa, CA, Menlo Park, CA or Sacramento, CA and you need tennis and basketball court resurfacing, give us a call. No one else brings the knowledge, experience and skill in tennis court resurfacing and tennis court repair that we do. If you need to renew and resurface your home court, or you want to add a fun new attraction to your park, give us a call and see how we can make a difference for you. President of First Serve Productions, David Klembith, has had first hand experience with court surfaces, having played 25 years of tennis, including 3 years on the professional circuit. His personal experience with court surfaces translates to unsurpassed knowledge with basketball and tennis court construction, resurfacing and repair. Revitalize Your Court with Tennis Court Resurfacing! Playing on a compromised court can result in lowered performance and even injuries. Small cracks and chipped paint may seem minor, but these minor defects can lead to larger issues in the long run. First Serve Production can address any issue regarding a tennis court, providing a tennis court resurfacing if damage is minor and a tennis court repair if damage is extensive. We provide tennis court resurfacing to ensure long-term protection from various elements and resistance to the sun’s damaging ultraviolet rays. Our premium tennis resurfacing products and unparalleled service will keep your tennis court in its best shape for years to come. We can repair and resurface your tennis court to bring it back to a new-like condition. For cost effective services in Lafayette, call First Serve Productions Inc for tennis court resurfacing and repairs. We offer quality tennis court resurfacing and tennis court repair services for clients in Sacramento, CA and the surrounding areas. We use the best technology to restore tennis courts that need repair. We can make your court look as good as new after we have finished our job! Our services are affordably priced. You can always rely on us to complete your work in a timely and efficient manner. Get in touch with us today for quality tennis court resurfacing. Similar to tennis courts, basketball courts need to be in excellent quality in order to prevent injuries and maximize the playing experience. As with tennis courts, basketball courts are very similar, and small repairs like a basketball court resurfacing can restore the court to its original glory. A quality court comes down to the materials that are used. First Serve Productions uses state-of-the-art materials and colors to provide the exact look and feel that is desired in every tennis and basketball court resurfacing job. Most importantly, proper use of materials can save on costs and provide the long-term support and durability you desire. The proper cushioning system incorporated into a surface can save wear and tear on an athlete, and resilient surface materials will guarantee a court’s visual appeal for years to come. Call today for more information on tennis court construction and basketball court construction. Our goal is to provide the highest level of workmanship when it comes to tennis court construction, renovation, and resurfacing while maintaining a strong relationship with all our clients. An initial meeting with our representatives can be scheduled to go over your needs and provide a quote to build a tennis court in your backyard or facility. We are here to provide the residents and businesses in Napa, CA, Menlo Park, CA or Sacramento, CA with professional quality results that will not only add value but also provide years of enjoyment. If you're serious about your game, then you need to be serious about your court. Tennis court repairs and resurfacing are about more than aesthetics. They're about bringing your game to the next level. Not only will you play better on a court serviced with quality materials by the experts of First Serve Productions, but you can also save yourself some physical wear and tear. You might find small, insignificant cracks and paint chips easy to ignore, but you should keep in mind that even minor defects can add up over time to lead to real disasters in the future. No matter if you're looking to build a home court or if you're looking to add a new feature to your park, First Serve can help! First Serve Production is Hillsborough and Lafayette's basketball and tennis court repair expert. Call us today for more information on how we can bring the luster and shine back to your court. 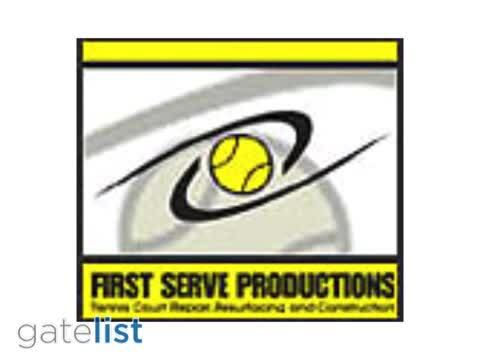 First Serve Productions, Inc, is a Bay Area company specializing in basketball and tennis court repairs, resurfacing and construction. First Serve Productions has state-of-the-art materials and colors available to meet the specific requirements needed for any court surface.